Once known for its bankers, always known for its wine, Cahors makes a convenient stop on the road between the Dordogne Valley and Toulouse. Cahors, 113 km (70 miles, 1-1/2 hours) north of Toulouse (map), is a small city nestled in a bend of the Lot River in the midst of winemaking country. 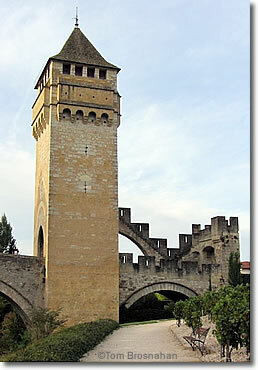 Famous since medieval times for its wines, Cahors is symbolized by its Pont Valentré (1378), the fortified bridge that crosses the Lot near the city center. Cahors was once among the richest banking centers of Europe, and the wealth from banking and trade allowed the Cahorsins to build and decorate beautiful hôtels particuliers (mansions), châteaux, churches and public buildings, some of which have survived the numerous battles and wars that Cahors suffered through the centuries. Although much of Cahors is modern, the historic district on the eastern side of the city center (find your way to the cathédrale) is worthy of some time, and the city's main avenue, boulevard Léon Gambetta, is a classic sycamore-lined French urban central artery lined with shops, businesses and café-bistrots.